Halibut with mousseline and grapefruit at Mooncusser Fish House. Mooncusser Fish House sounds like it should be a shack by the beach, the sort of place where seafood is battered and fried and served piping hot on paper plates. That’s one kind of perfection. To see the aesthetic in one plate, order the smoked scallop terrine, a bipartite slice with a jouncy texture, the bottom half flecked with chives, the top embedded with chunks of scallop. It’s served with house-made crackers sweetly pricked with fork tines — their hominess feels like a mark of care. The dish is reminiscent of aspic, which isn’t fashionable at all but should be, will be. The terrine is the Hazel of appetizers. One day the name belongs to fusty great-aunts, the next it’s for celebrity babies. Or look to one of the few main courses that doesn’t feature seafood, seared duck breast with spelt pancakes and kumquats. This could be a clever take on Peking duck, with kumquats standing in for hoisin sauce and spelt crepes for the usual pancakes. That dish would feel very 2018. Instead what we get reminisces about the reign of New American bistro fare: rosy slices of duck arrayed over puffy pancakes, topped with hazelnuts and jammy bites of kumquat. It isn’t retro enough to be retro — yet. Chef Carolyn Johnson’s menu takes us back to a time when restaurants were restaurants, not small-plates free-for-alls where “everyone shares family-style,” triggering the survival mechanisms of anyone who grew up in a household with more than two siblings. There is no need to gobble here. Everything comes in order, not “as it is ready.” Honestly, it’s a relief. Anyone who spends time on social media will welcome an experience with clear personal boundaries. First there is bread — a thick slice of sourdough, a puffy roll — placed on your plate by someone bearing a tray and tongs. (Later, someone else will appear to sweep away the crumbs.) It comes with a little crock of very good, softened butter, and the bread itself is very good too. It’s not a knock on the rest of the food to say that this is one of the meal’s most-pleasurable moments. There are plenty: a mackerel crudo with slices of bracingly fresh fish arrayed in an arc around the plate, crimson edges aligned, striped with sprinkled chives, Meyer lemon rind, and smoked chile, all in balance. Tuna tartare is pretty gorgeous, too, with its sprinkle of pistachios and underlying funk of just enough foie gras. Again, balance. Soup’s not on menus much these days: too hard to share. Here we get two. 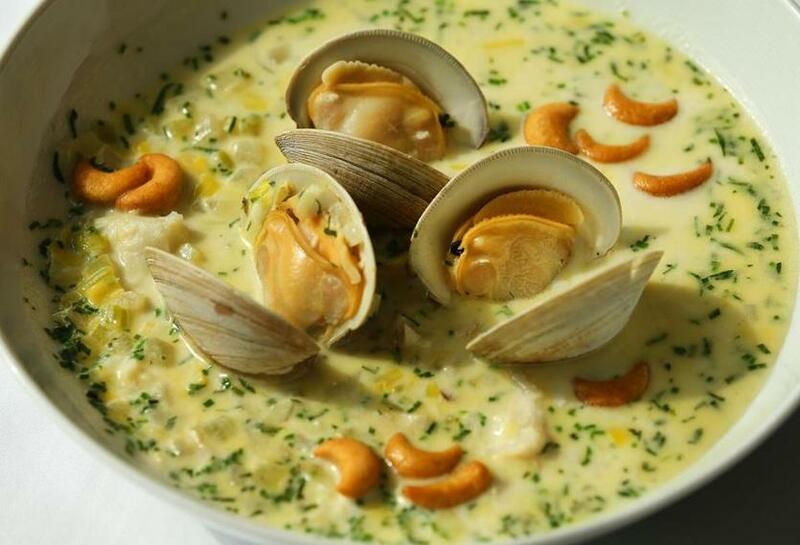 The Mooncusser chowder is an elegant version, a thin broth stocked with clams, smoked scallops, and skate. The soup crackers are shaped like crescent moons, a charming touch that makes everyone smile. There’s also turnip soup with poached oysters and pear cream. Again, elegance. Much of Mooncusser’s success derives from the simple-yet-not-so-simple thing of a good piece of fish cooked well. 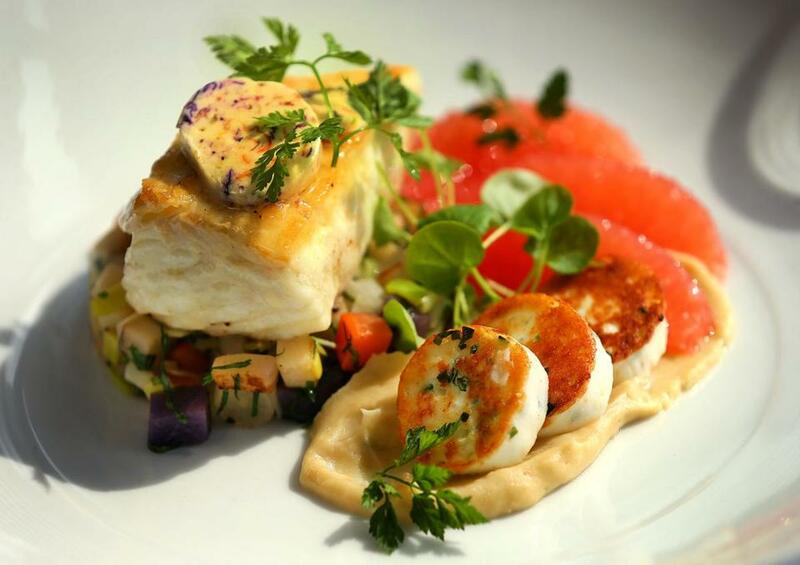 Halibut is seared golden, the mild, flaky flesh accented with flavor from nasturtium butter and segments of grapefruit, served with parsley-root puree, root-vegetable hash, and springy circles of halibut mousseline. 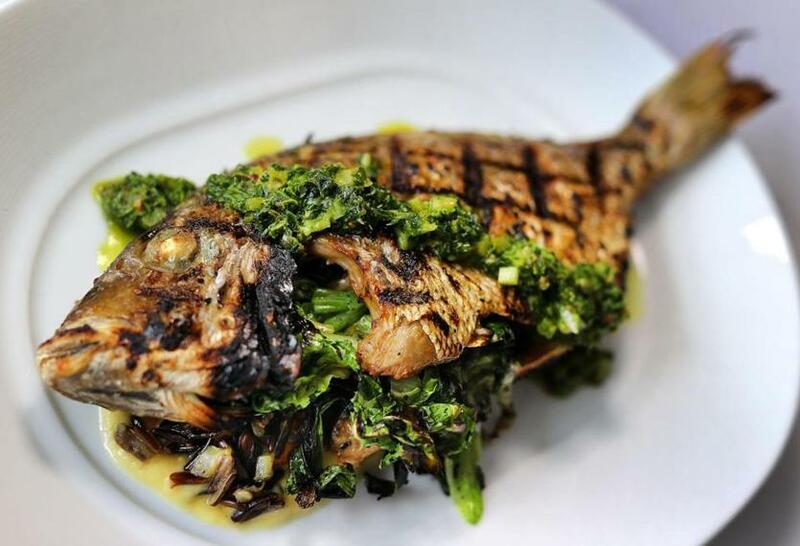 Whole scup comes striped black with grill marks, over celeriac puree and wild rice, salsa verde draped across its middle like a sash. The foundation is always in place. 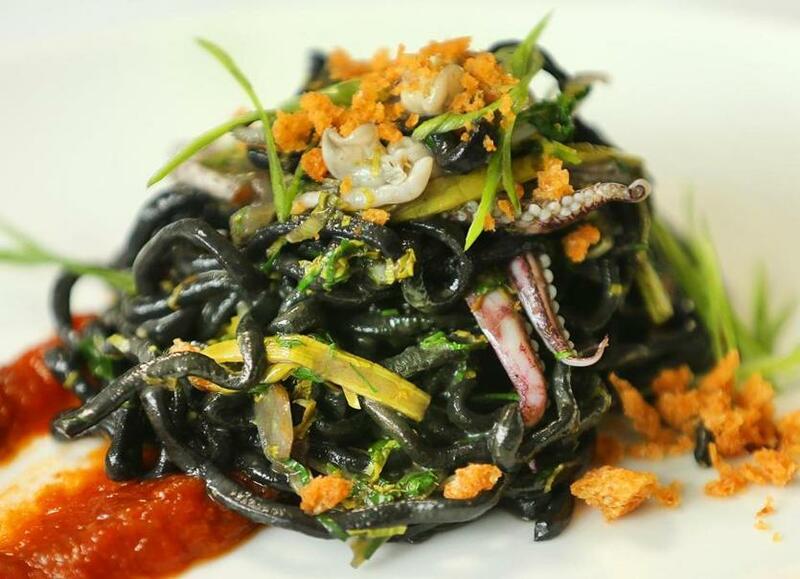 The details are where dishes sometimes founder: tender squid on wonderfully chewy squid-ink pasta, perfect but for the intense Christmas-y spicing of tomato jam smeared all over the plate; sweet scallops served alongside mushrooms that deliver mouthfuls of grit. Dishes that sound lavish, thrilling — fennel custard with uni and truffles; monkfish with caviar, kohlrabi, and tarragon bourride — don’t always taste that way. The uni is so fresh it’s practically quivering, but the custard lacks flavor, stiff rather than silky. The monkfish needs seasoning; the flavors don’t pop. Order creme fraiche panna cotta for dessert and you get a few gelatinous blobs strewn across the plate. Espresso semifreddo is intense, encased in a hard shell of dark chocolate; the pistachio-dusted fragments of meringue are my favorite part. 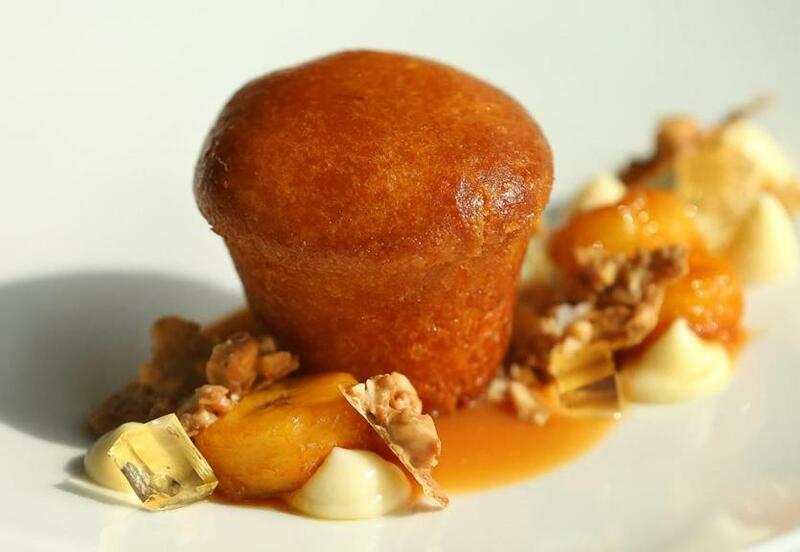 But the clear winner is pastry chef Katie Hamilburg’s baba au rhum, a boozy little cake that arrives in a pool of caramel with bananas and a granola-esque crisp. It’s tomorrow’s trend today. Yesterday’s, too. Mooncusser Fish House is one of those maddening restaurants that can serve you your best meal in months on one visit, a merely middling one the next. But it was so good last time! Will it be so good next time? There’s only one way to find out. The dining room’s setup is slightly awkward — the two-top banquettes in the middle of the room are so extremely comfortable, but they put you head-to-head with the diner behind you. It’s a great setup for passing intelligence, a bad one for private conversation. So take a table beside those windows that offer that view. Order a bottle from the wine list, full of interest, sparkle, and range. There’s bread, there’s soup, there’s fish cooked right; there’s a rhythm to the meal. This is dinner in an almost classical mode. The Boston below sometimes forgets the value of this, but deep in enjoyment, the second-story crowd clearly recalls. 304 Stuart St., Boston, 617-917-5193, www.mooncusserfishhouse.com. All major credit cards accepted. Wheelchair accessible. Prices Appetizers $10-$16. Entrees $30-$42. Dessert $8-$15. Noise level Inoffensive background music. May we suggest Tuna tartare, mackerel crudo, Mooncusser chowder, halibut, whole grilled scup, baba au rhum.